Cruiser was our first stallion and holds a special place here as such. He is at the heart of our breeding program and has produced wonderful broodmares as well as fine performance horses. 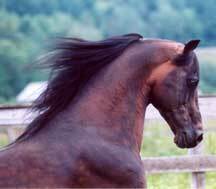 For several years he was a successful saddleseat type show horse and show harness horse. A consistent winner on the A circuit in hand, in harness and under saddle, he has numerous blues and tricolors to his credit from Maine to OKC! 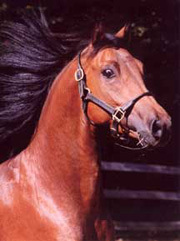 Cruiser retired to the farm in 1990 but he had many jobs after leaving the show ring. He had some basic dressage training, went to sleigh rallies, spent quite a bit of time out in the woods on trail rides and sired a number of fine foals for us. 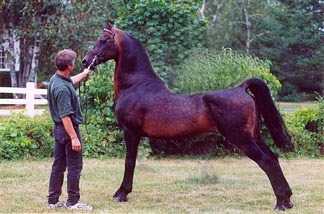 As an aged stallion, he retired in 2004 and lived happily here unltil he passed in the summer of 2010 at the age of 27. He was much beloved and is sincerely missed by all.